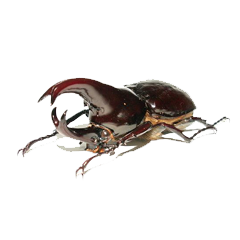 The brown rhinoceros beetle or fighting beetle, Xylotrupes gideon, is a species of large scarab beetle belonging to the subfamily Dynastinae. It is particularly known for its role in insect fighting in Thailand. Xylotrupes gideon can reach a length of 3.5–7 centimetres (1.4–2.8 in). As usual with horn beetles there is a great difference between the genders. Males are larger than females. They have two chitinous bifurcated horns, a thick thoracic horn and a smaller cephalic horn, which they use to eliminate their rivals during the mating period. These beetles are shiny dark red, dark brown, or black in coloration. The eyes are located on each side of the head. When disturbed these beetles make a hissing noise, produced by rubbing the tip of the abdomen against the edge the elytra. This species can be found across much of Southeast Asia, south to Australia and east to the Solomon Islands.